Nara is a tourist landmark and has therefore wide variety of hotels in any category. The period of ACMMM2012 is the best season for sightseeing in Nara and a very famous event called Shosoin Exhibition will be held. Because a lot of people will stay in Nara, booking in advance is strongly recommended. 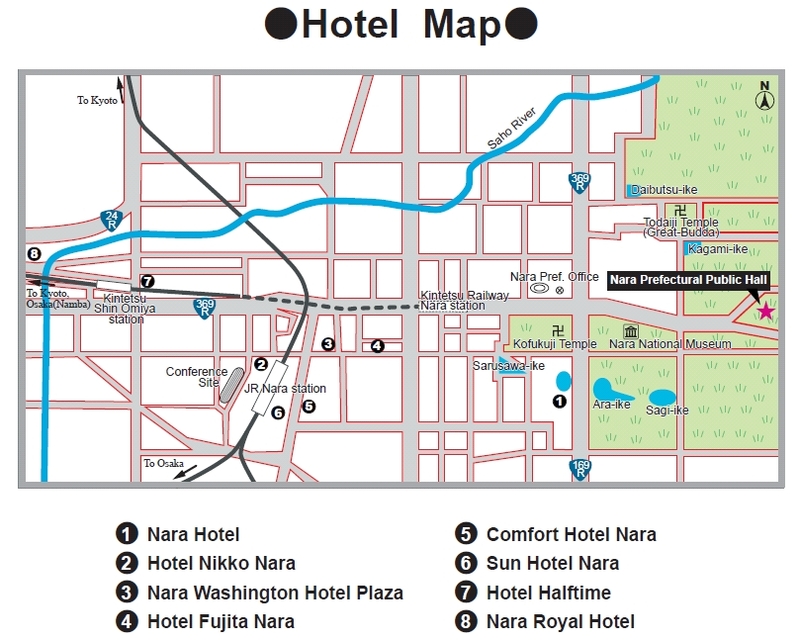 Rooms have been reserved for the ACM Multimedia 2012 attendees in selected hotels in Nara at special rates. For your room reservation, please use the booking site at the bottom of this page (do not contact the hotels directly if you would like to take advantage of the special rate). For the use of bus, see Moving inside Nara and About Bus in Nara for details. *Room rates are per night, including breakfast, service charge and consumption tax. *All rooms are in Western style (there are no Japanese style rooms). *Free Internet is availabe in all rooms. *Room rates are valid for the stay during October 28th to November 2nd, 2012. *The booking site will be available until October 15th 23:59 (UTC -8). *Reservation is made according to a first-come first-served basis. Some hotels may be sold out before the deadline. A cancellation fee must be paid if you cancel less than 8 days before the first night of stay. See the reservation site below for details. The following sites will also be helpful.